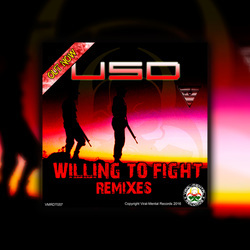 5 remixes of USD's debut release on VMR, 'Willing To Fight'. Remixes from Cynical Gene, HEKTIC , DREDILLAH, Paladin, Skorpz. ​Support from: DreadRecordings / DJ VIRUS(Koollondon) / DJ UZI (RoughTempo) / FARSCAPE(Crednb, Bedlam) / MADLOGIK / +More. Dread Recordings - "WILL SUPPORT CLUB AND RADIO 7/10"
BREAKBEATSCIENTIST (StricltyNuSkoolBlog) - "Dredillah rips up USD's 'Willing To Fight' and gives it a pitch black, heavy stepping relick destined to devastate all sound systems!!! 10/10"
DJ VIRUS (Koollondon) - "loving these remixes - big upz to the VM team everytime..1up 10/10"
DJ UZI - "nice remix's !! 7/10"
FARSCAPE (Cr8dnb, Bedlam) - "Love the different versions on this. USD brings his unique style again and then the VMR crew step it up. Paladin kills it with a fantastic remix!! 9/10"
MADLOGIK - "Awesome, love the Original, but Paladin's remix has the darkness my soul desires :) 9/10"
Tariq Ziyad (DnBMuzik) - "great tune, gnarly vibes, pounding beats, heavy remixes!!! great work!!! 10/10"
SKORPZ - "Serious ep 8/10"
RESON-8 "Big up's to USD massive track, the original and remixes are all GRIMY!!! Big up's to everyone involved!! The Cynical Gene remix.... ooo my days, yes all the way!! 9/10"
CYNICAL GENE - "Look forward to playing some of these on my show !!! 8/10"
EXIT POINT - "BIG Neuro Roller by USD 8/10"